Who ever made February the shortest month surely knew that they were doing A Good Thing! Our current cold snap is turning into a much longer ssssssnnnaaaapppp than one would hope, with cold temps forecast into the first week of March. Spring does not seem anywhere near round the corner! The days are much longer and with this cold weather we have been having gloriously sunny days. Frankly I much prefer this to...spring breakup. But the other side of that bit of nastiness is, ta-DAH! - Spring! I did not make as much progress this month as I'd hoped. Niggling heath issues meant it became a high maintenance month with lots of appointments to doctors, labs, chiropractor, etc. But things seem to be settling down now so it's all good. This warp is for a special order - maybe. I've been working with a designer for over a year now, trying to find a good fit with what I want to do and what she thinks she can sell. If she doesn't find this a good match, I will simply add it to inventory and carry on. Although I didn't take a photo of it, I am finding that a temple is necessary, which is somewhat slower than without, but is giving me a better 'quality' of cloth. So, since it is necessary, I use it. Weave like a Pirate? What? Where did that come from???? 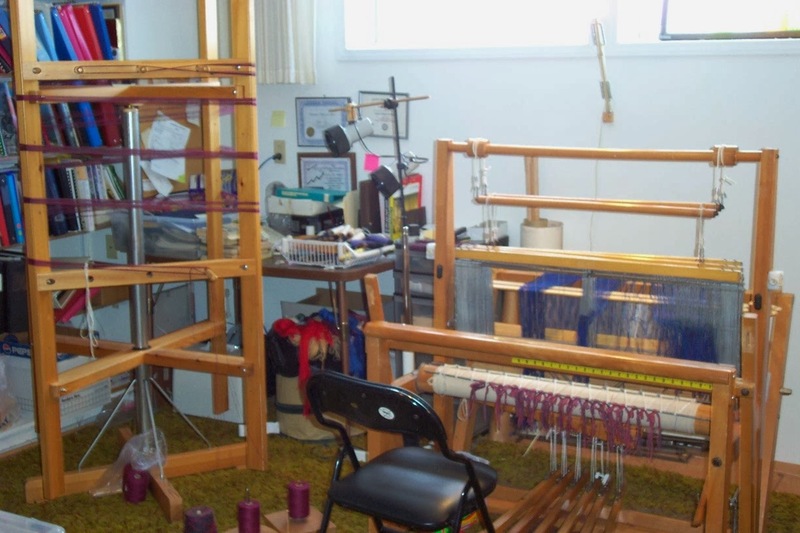 I couldn't sleep the first night at John C. Campbell in January and while the thoughts roiled through my brain I thought about what weaving efficiently was, how some people were adamant that their method was the only method to use or you courted doom, etc. Or, in other words, Weave Like a Pirate. Be a little out of the mainstream. Be a little daring. Be a little piratical! Go on, I double dare you. AARRRR! The past few days have been spent on some forward planning (as the saying goes). 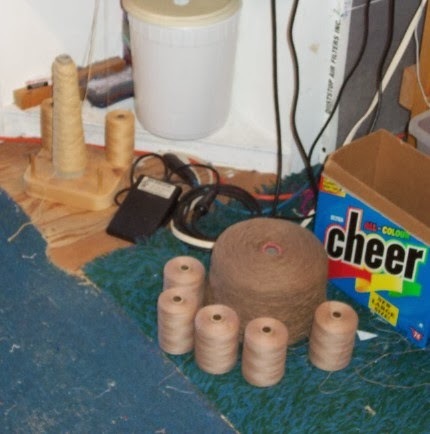 After sorting through all the yarn and selecting that which we would try to sell at Fibres West Doug has spent the last few days breaking the large mill cones down into smaller quantities. I have an industrial cone winder so this is fairly painless, if somewhat boring, but makes nice tidy cones all of approximately the same size. Much easier to price when they are all within the same weight, plus or minus. I also received an invitation to teach in the Seattle area and since I'm booked there in April of next year I suggested tagging on to that trip. We'll see if that works out or not. The thing is, there are no guarantees. Workshops fail to fill. Books fail to sell. (Anyone want A Good Yarn: Rayon? Got lots.) Shows fail to bring in enough customers who want to buy your stuff. But I can't do anything else than what I do. Weave. Write about it. Teach it. This afternoon Doug and I went through all of the boxes of Lynn's yarn. The second photo was taken after we were nearly finished. 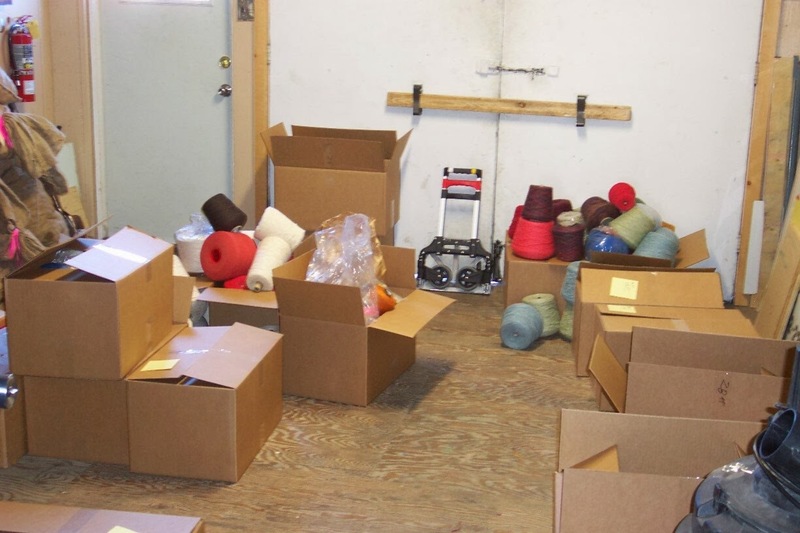 Thank goodness the annex has a fairly large loading dock as we were able to open all of the boxes, sort through the yarn and divide it up into a) donations b) stuff to be re-coned for sale and c) stuff that I would keep in hopes of using it up, some day. After spending 3 days from dawn to past dark doing the initial sort at Lynn's, then another almost 3 hours today, the yarn represents a significant investment in time - and the cost of bringing it home as well. Since there were a number of yarns that she had collected in depth as well as breadth, I'm hoping that selling some of it will recoup the actual financial outlay of getting it home. Doug will start coning the large mill cones off onto smaller cones suitable for an individual to purchase - not everyone wants a kilo of something, let alone several. Most of the yarn is fairly fine so a little goes a long way. 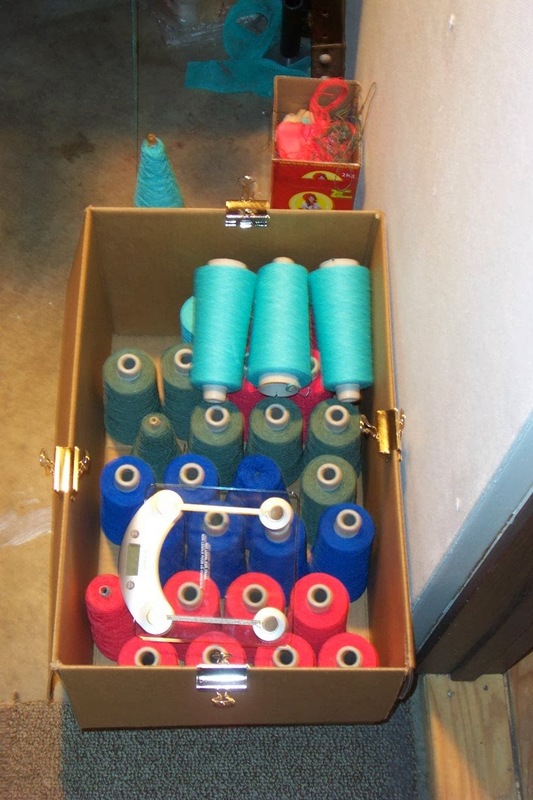 Realistically, I have to come to grips with the fact that I could not possibly weave all of what I have plus all this yarn, too, in my lifetime! We will offer some of it for sale at Fibres West in Cloverdale, BC in March, and again at Olds Fibre Week in Olds, AB in June. 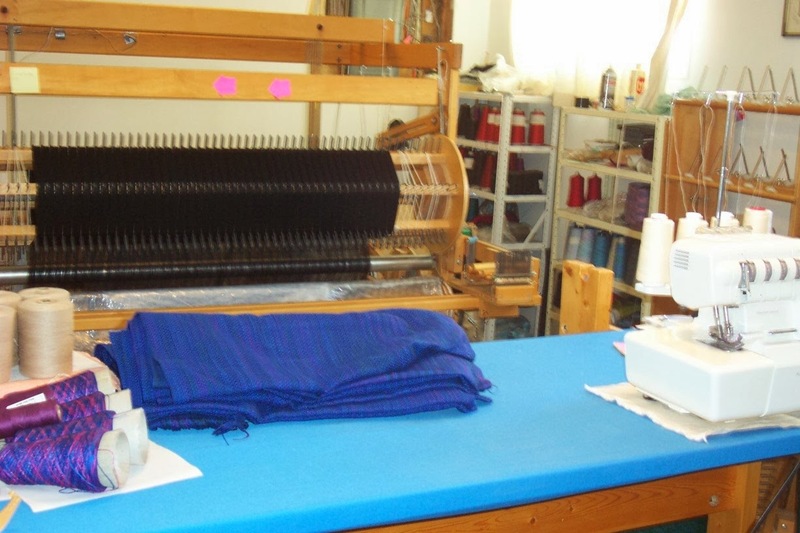 We will also have the warping mill for sale. The Leclerc warping board has been sold. I was going to title this post Deja Vu or something because it feels as though I've been stuck in some sort of weaverly Ground Hog's Day, the only thing changing being the colour of the current warp. 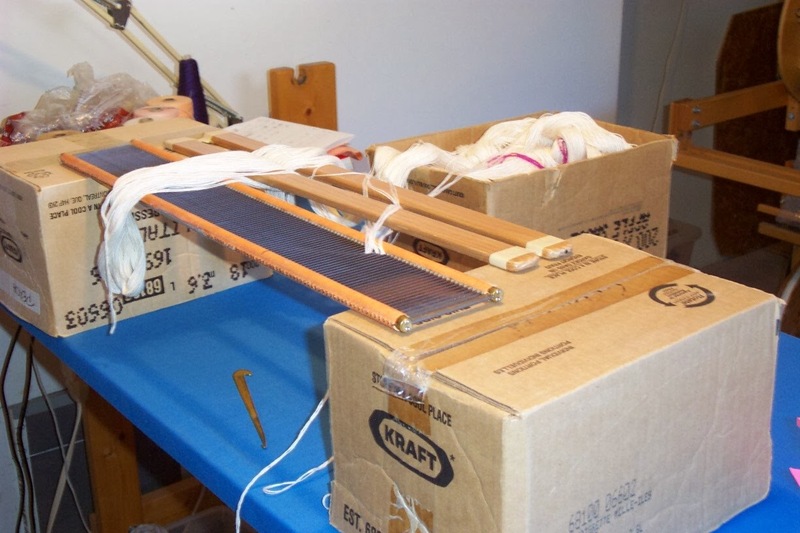 I have decided to go ahead and sell the warping mill. It is a Glimakra, quite large, and it doesn't fold. It's very cramped in my studio so it needs to find a more welcoming home - one with enough space that it can stay 'open' all the time. It can be taken apart, but it's a bit of a fiddle to do it and really needs two pair of hands to do it comfortably. I'm not sure how long a warp can be wound on it. I've been doing about 15 meters using only the upper part so it could probably do 30 without too much difficulty. Each side is about 30" and it stands about 5 feet tall. It's a dream to wind warps on, rotates at the barest touch of a finger, quiet and smooth. If someone is interested, we could deliver it in March to Fibres West (in Cloverdale, BC) or to Olds for the Fibre Festival there in June. If it doesn't sell by the end of June, I will consider shipping it elsewhere in Canada. We also have a brand new, never-been-used, never taken out of the box (other than to be inspected by Doug, near as we can tell) Leclerc warping board that will wind warps up to 21 yards. Again, we could deliver to either fibre festival. According to the Leclerc website the board measures 22 3/4" by 64". Price for the mill is $250, for the board $100. Shipping to elsewhere than the above mentioned locations would be extra. 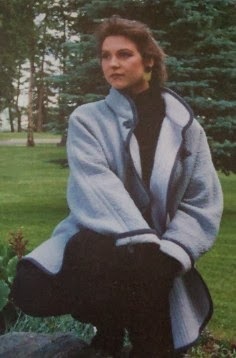 Kate asked about the coat fabric, and wondered if it wasn't too distorted from the shrinkage differential to be used. Well, yes, that is a valid concern. In terms of designing this cloth it had to be flexible and stable. I also wanted it to provide insulation. I do live in an area of the world where cold in the winter is a reality. This cloth is just pushing the edge of working. It is thick. You may be able to see that the seams have been stitched down (see sleeve) as one way to stabilize the seam. 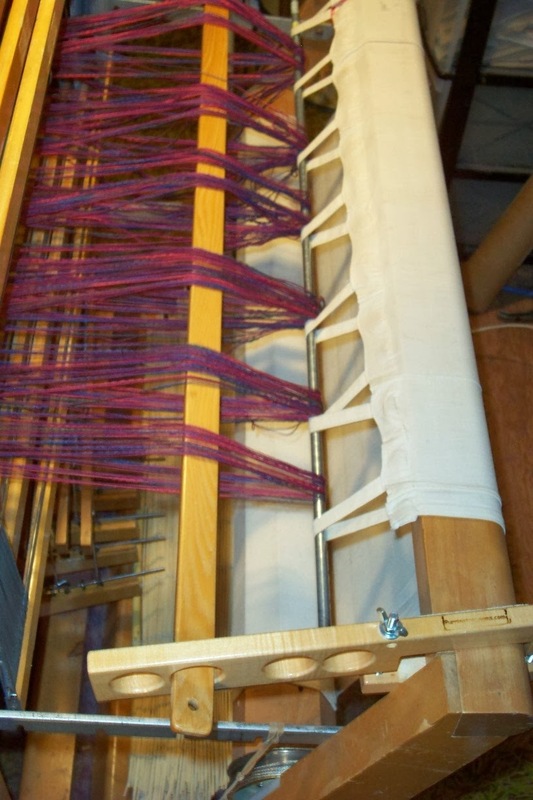 The warp was wound on two beams, the 2/8 cotton at 16 epi for the surface, the fine wool/cotton blend at 32 for the lining. Since the two warps would take up at different rates, beaming them separately was the safe thing to do. 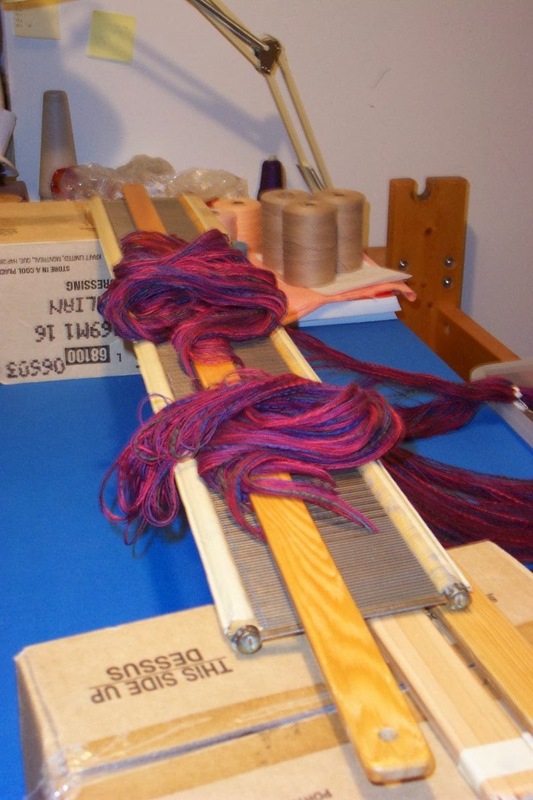 Since my loom has two beams, it was also easy to do. The cotton was woven in a plain weave structure, the wool/cotton blend in a 4:4 twill. 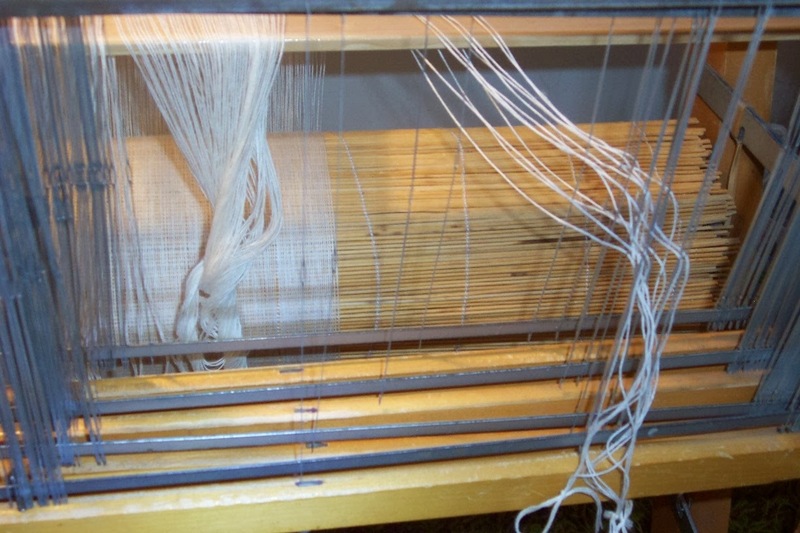 The two layers were woven separately except for the occasional tie or stitch which was accomplished by pulling one of the surface threads into a lining shed in a way that the stitcher would be hidden. I could have just as easily made the stitchers be decorative as in pique', but that wasn't the effect I was aiming for. The stitching order was a satin progression because I wanted to minimize the twill line. This was sort of successful. The stitchers were far enough apart to loosely bind the two layers together and the twill line is not continuous, giving a crackly, pebbly surface to the cloth. Unfortunately my software file for this design did not survive a computer upgrade, several upgrades ago and I no longer have the original file. The photocopy of the version I do have is tiny in order to fit into the binder. If anyone wants it to see if they can reconstruct the draft, I will happily scan and email it. I tried, but it is going to take more hours than I have to spare to do it myself. I confess that it is always a bit of an ego stroke to be asked to supply a guest post for someone else's blog. Recently I was asked to make a guest appearance on the blog of The Woolery a shop in Kentucky. When I visited their website I discovered that they carry yarns from Maurice Brassard & Fils. Since weavers in the US are always interested in my 2/8 cotton yarns, it was nice to discover another US supplier of the yarn I use so often. 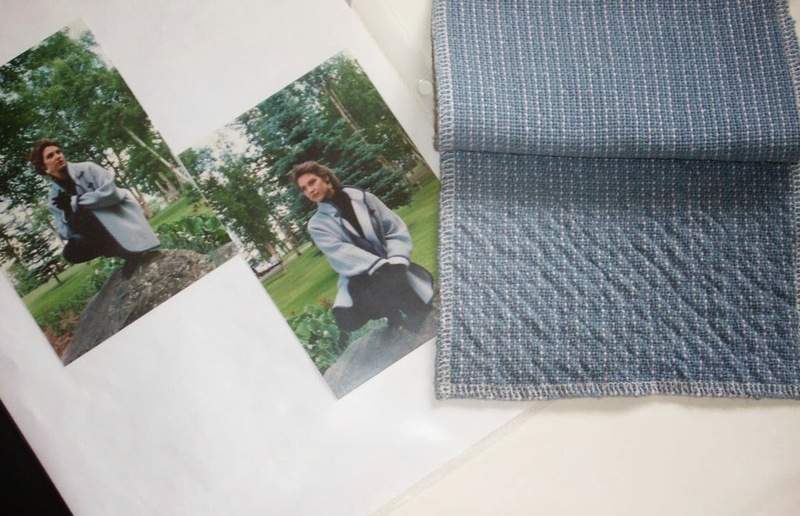 The fabric in the above coat is a stitched double weave. The exterior is good old 2/8 cotton, the self-lining is a fine wool/cotton blend. 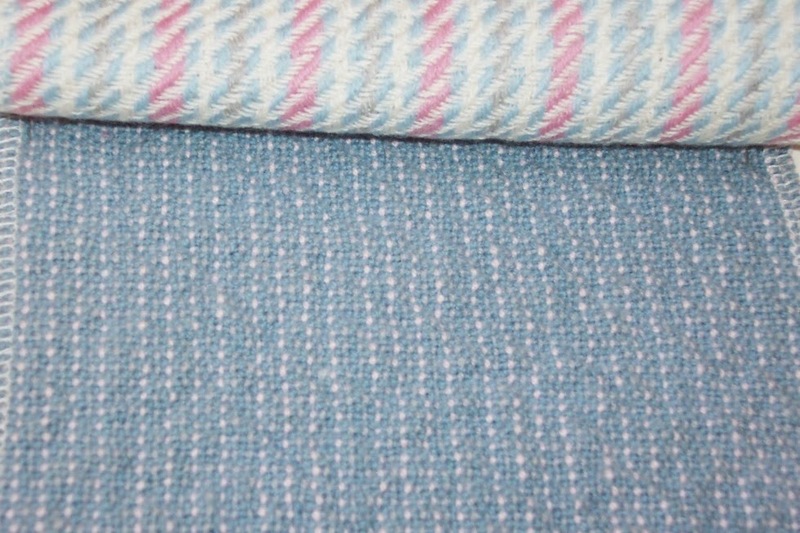 I wove this fabric, oh, way back in the late 1980's, as part of my master weaver level for the Guild of Canadian Weavers. I still have it and wear it occasionally; in fact I wore it to an appointment yesterday where it provided a few minutes of conversation as an example of the type of thing I can weave. I can't say I get bored, but I do get tired. Bottom line is, I'm tired of doing these towels. The first couple warps were interesting as I pursued a new design, but I'm anxious to get cracking on the Big Project samples and these last few warps are becoming a bit of a roadblock as I hunker down to just get them done. Add to that my lower back went into spasm yesterday and weaving isn't much fun at the minute. I had a massage appointment already booked for tomorrow but a quick phone call to the chiropractor revealed that they had no openings until Wed. So I am very gingerly weaving. Instead of doing two towels a session, I decided this morning to just do one, then take a break. The slower I go means the longer it will take to clear the rose, blue, then the final (halleluljah!) red warp off my schedule so that I can carry on with the planning and executing of the BP samples. I am not a patient person. Being at less than my best physically is annoying. Having that physical hurdle preventing me from charging through these last three warps? Beyond irritating. But the fact is I can't weave at my usual pace so I'm just going to have to deal with the fact that it will be next week before I can start the samples. Hopefully by then my back will be much happier! Today was a lovely sunny day and I ought to have been filled with energy. Not so much. I don't know why I struggled to stay focused and get this warp ready to weave on, today, but I did. I kept thinking of things I ought to be checking on the internet - excuses, all excuses to not stay at the loom and finish threading this warp. I blame the phase of the moon. Whatever phase it is. In the end I did finally very late in the afternoon, manage to tie myself to the loom, finish threading, sley and tie on. The header is woven. All I need to do after dinner is wind some bobbins and start weaving. The blue warp is being wound and there appears to be just enough of the red to do one more red towel warp and once those are done, I am done with this series. At least I hope I am. 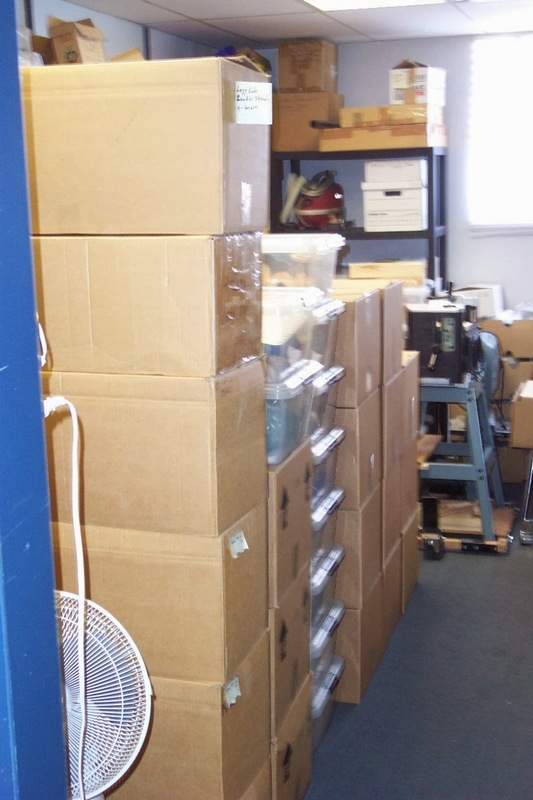 There are 20 plus boxes of yarn from Lynn's stash. I may discover another cone or two of this cotton flake still packed away! I pulled this combination of yarns before I left in January and am still undecided about whether or not I really like them. 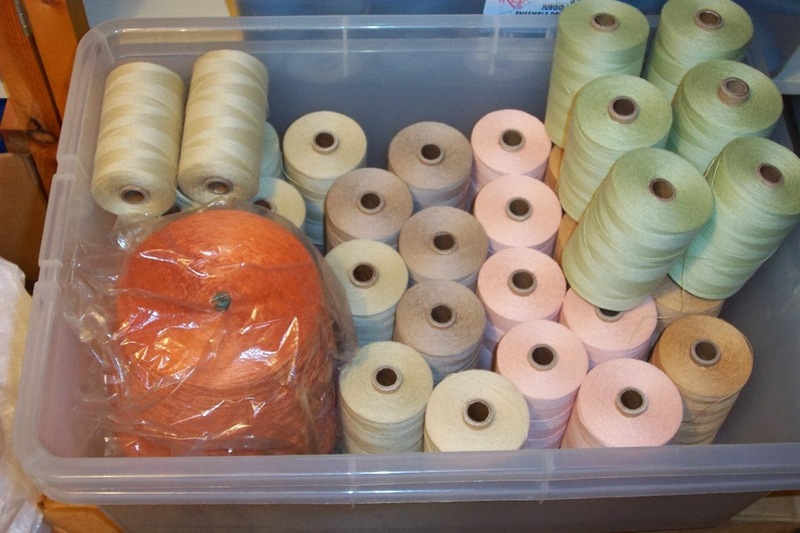 The spools are 2/16 cotton, the orange cone is 2/20 merc. cotton from Lynn's stash. I keep going back to see if they sit any better than they did the time before. I guess the only thing left is to just jump in, beam the warp and start weaving with the orange to see if it gels or not. If not, I do have a back up plan. There are still several cones of the 2/18 Fox Fibre Color Grown naturals, both in brown and pale green. I've used that combination before and the results were fine. In spite of a prediction of snow again today, the skies cleared and the sun was brilliant. But look how much snow we have! 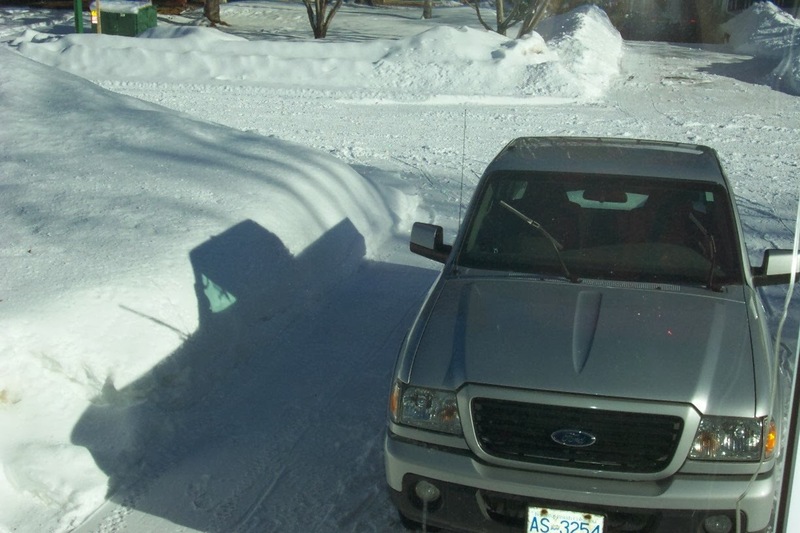 You can't even see the top of the pile in front of our house as both Doug and our neighbour to the north struggle to keep our driveways clear. Yes, the truck is a 'small' one, not full sized, but still! As far as weaving goes, I am making pretty good headway. 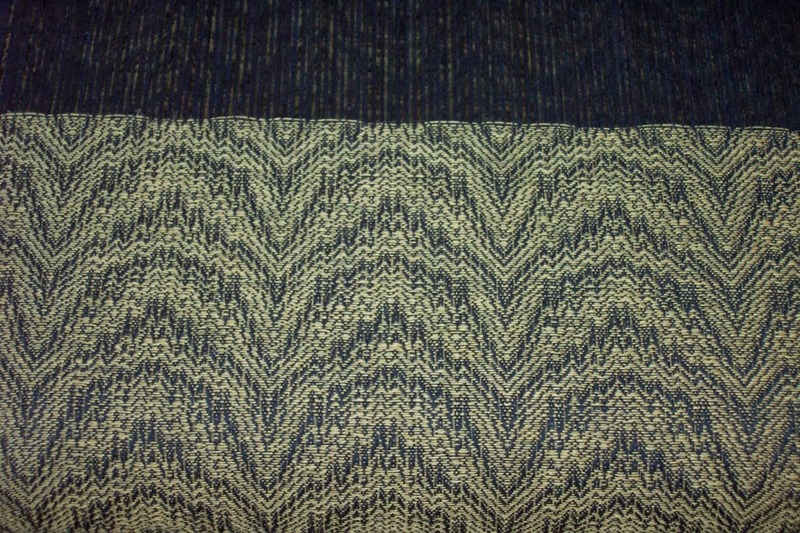 The blue of this warp is slightly darker than the photo shows, but I think it looks pretty good. Once this warp is done I'll do another towel warp of this design but in rose. Not sure if I will do more - I might do one last warp with a dark royal blue as the first warp in that colour was pretty short and I only have a few towels of that colour to put into inventory. Plus I've got another large cone of the blue/purple/green variegated cotton flake. So I may just close out the series with another dark blue. Once these towels are done I will begin on the sample warps for the Big Project. It is going to take some thinking to make sure I cover all the bases with the samples and I want to weave 'extra' in case of oopsies. I also don't want to be doing all of this prep work days before the deadline! So it is time to get cracking on that. At the rate I'm going it will likely be next week - if I can keep my momentum going. 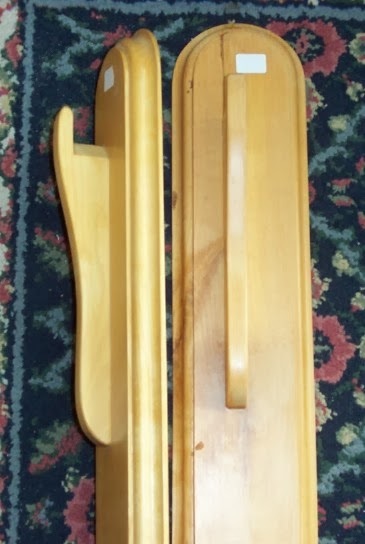 We have another mystery, this time it's trying to identify a couple of wooden 'tools' from a woodworker's stash. We have no clue as to their use. On the back side there is a hole, obviously meant for hanging on the wall. They are identical. 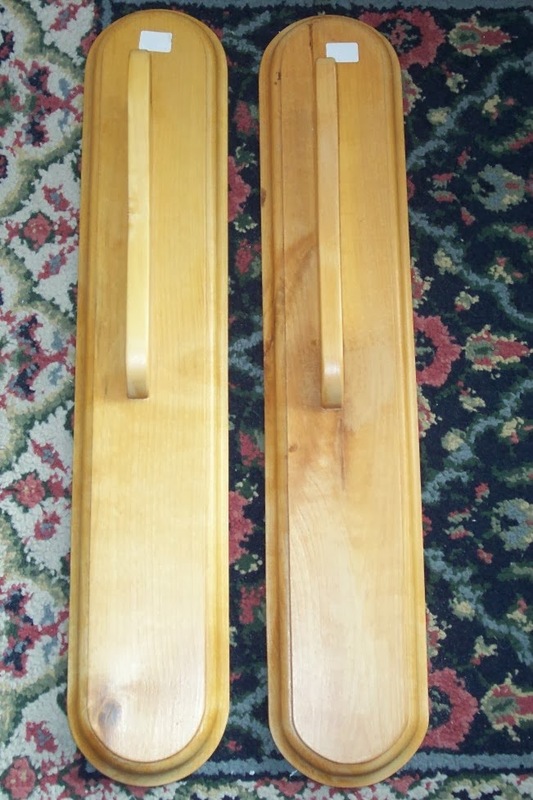 We thought at first they were a pair, but the shaping on the upright piece is the same, so not meant to face each other but used individually? About 18" long over all. The white things at the top are little price stickers with no information on them. So you may be wondering why I suspected insufficient tension during beaming as the cause of my problems? This is what was happening on the last couple of warps. The other thing I observed was that as I advanced the fell, even after a few meters/yards had been woven, the fell line got wavy. To me this indicated that as the warp slipped forward, it had done so unevenly. This is another indication that the warp had too much slack as it rolled on (too little tension during beaming). My solution was to add two cups of water to each of the jugs I use for weight. Two cups doesn't sound like very much additional weight, but I noticed the increased pull/drag as I wound the warp onto the beam! 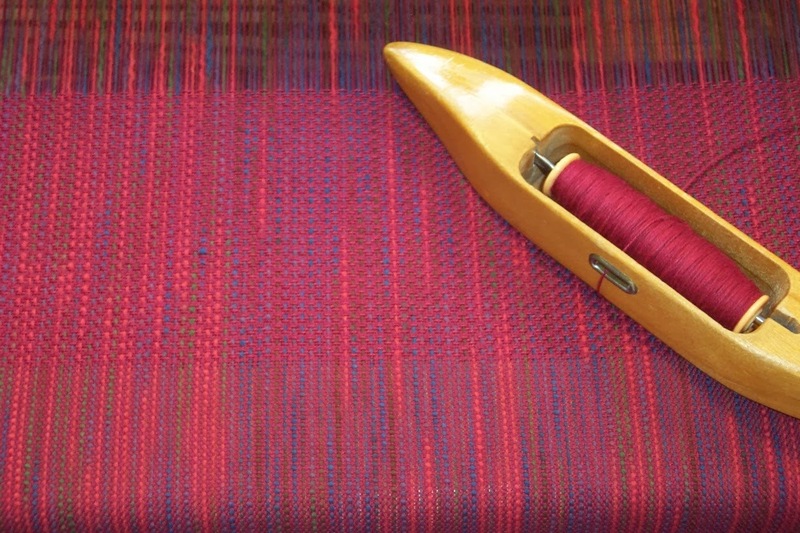 I'm pleased to say that I had no issues at all with this red towel warp. Cased solved! A friend asked if I could do a video of how I got the warp from the rough sleying into the loom. Not having a camera operator to follow along as I did it, I just took some still photos, hoping that will be enough information to help understand my process. The first photo shows the warp, already rough sleyed. In this instance, I am using a 9 dent reed putting 6 ends into every third dent in order to get close to my desired width. The warp was wound with three ends at a time and I don't want to split those ends up, so 6 at a time is required. 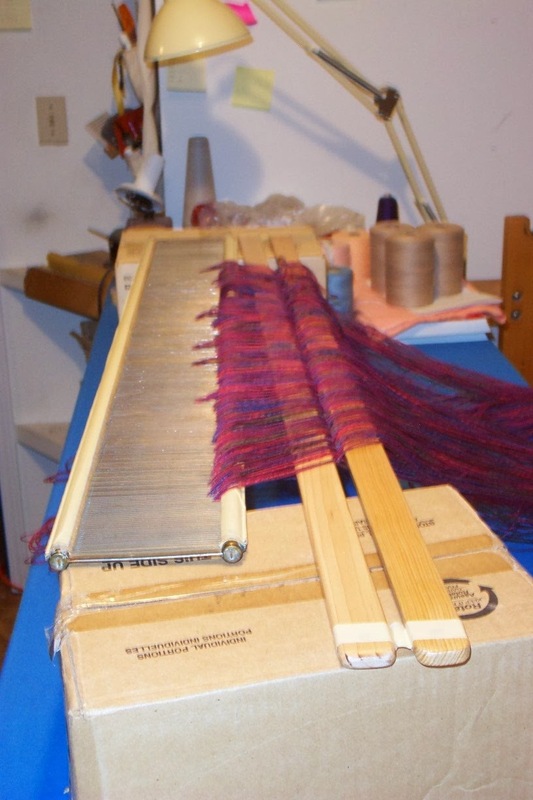 The warp is meant to be 24" in the reed for weaving. Using the 9 dent reed, it is slightly wider than that, which is what I prefer if I can't get it exact. Once the warp is rough sleyed, I flip the reed over top of the lease sticks. Notice there is about a finger's width of space left between the lease sticks. I've found that much closer and the sticks will tend to 'pinch' the threads making it more difficult for the warp to slide between them. 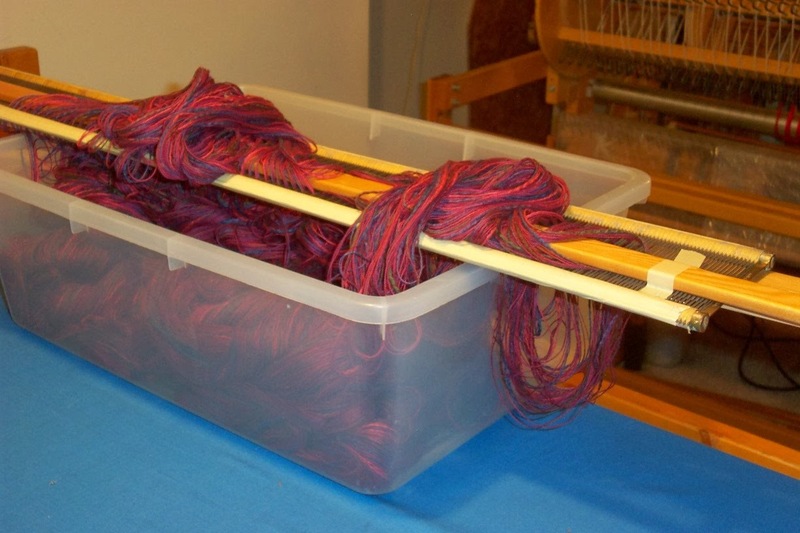 With a wider warp I have to take the yarn in sections in order to create a shed to slip a third lease stick into the loops to prevent them from falling out of the reed and to make it easier to carry the loops to the back of the loom. 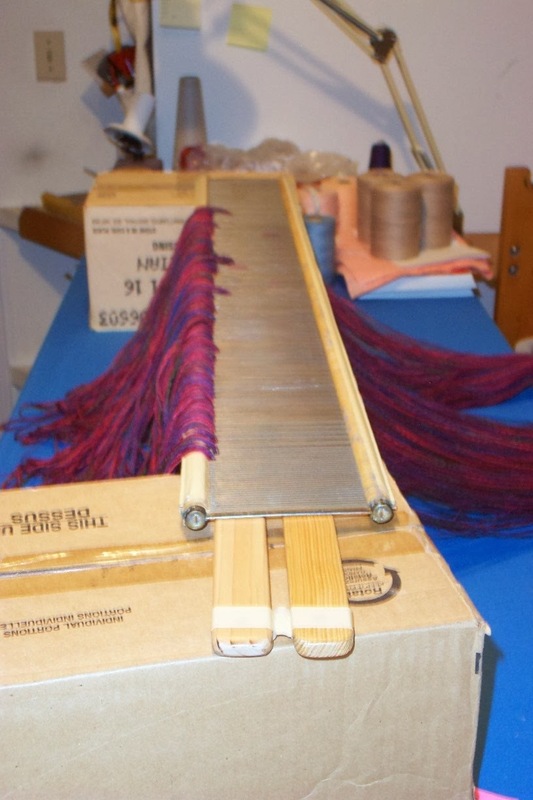 Showing the warp loops all onto the third stick, piled on top of the stick and the reed. ...and carried over to the front of the loom. The bench has been set to one side, the beater still has the top on it but no reed and the heddles are pushed to either side of the loom. The reed and lease sticks are lifted up and the bottom of the reed slid into the beater. Very important at this point to ensure that the warp is not caught in the beater either at the bottom of the reed or the top. The loops are carefully eased through and then the beater top fastened down to hold the reed in place. For a wider warp it is often helpful to have another set of hands to assist with this bit, but I can do it by myself. The third lease stick with the loops on it is carefully eased by the heddles and placed into the Angel Wings. 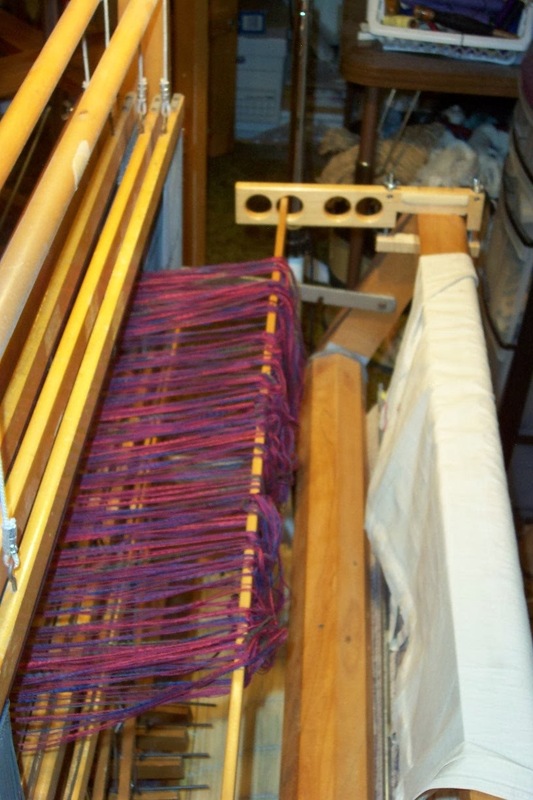 With the stick being held by the Angel Wings, it is a fairly simple matter to thread the apron rod through the loops and apron, securing the warp to the back of the loom. Once secure, remove the stick. 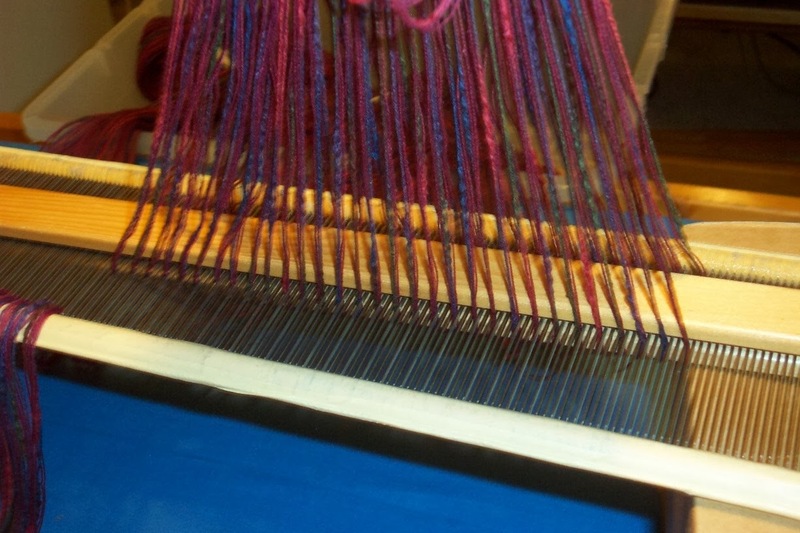 After that is done, I go to the front of the loom and gently ease any uneven threads back to even. If the choke ties are properly secured, there should be little to no slippage of the rest of the warp during this process. 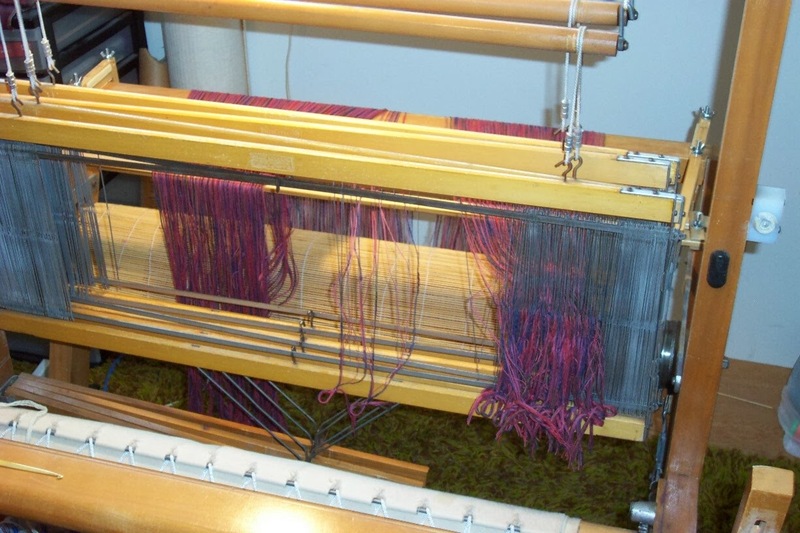 After straightening the loops out at the back of the loom, the warp is placed around the valet rod, the choke ties are removed, the weights hung and beaming can commence. Since I started using the mill making warps longer than my usual, I've noticed something interesting. I've been having mild tension 'issues' indicative of inconsistent tension during beaming. After observing this happening several times, I've come to the conclusion that longer warps need higher tension while going onto the beam. There are many people on the internet who stoutly maintain that you must not wind the yarn off the end of a tube. They give the reason that winding off the end of the tube will either add or subtract twist depending on the direction the yarn is wound. You will notice that I have my tubes on a 'post' and I most definitely take directly off the tube from the end. However, I always set my tubes up so that they wind off the same direction. I don't know if I'm adding or subtracting twist - have never bothered to figure it out. I just do what I do consistently. Why do I prefer to take it off the end of the tube? I don't have to 'fight' with the spin of the tube, jerking and dragging or casting off more yarn than I need just at that moment and worse, wrapping that excess yarn around the axle on which the tube is placed. In the end I feel I get better results - more consistent tension as I wind my warps. Turns out this warp is the same length as the last, so the last one was also about 14 meters. And, since I was able to nurse it through to the end, I won't bother cutting off mid way and re-tying, I will just nurse this one through to the end, too. Since this warp is identical in every way to the last one, why didn't I just tie it to the old one? There are several reasons for that. 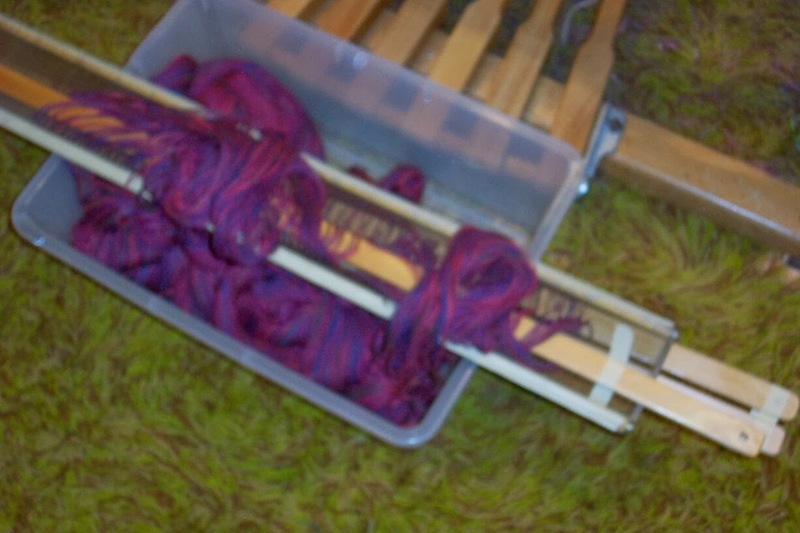 One, I'm faster at completely re-dressing the loom than I am at tying knots. Secondly, this yarn still has residual twist energy in it so it's a bit unruly. Trying to tie knots into it then nursing the knots through the heddles would not be a whole lot of fun. 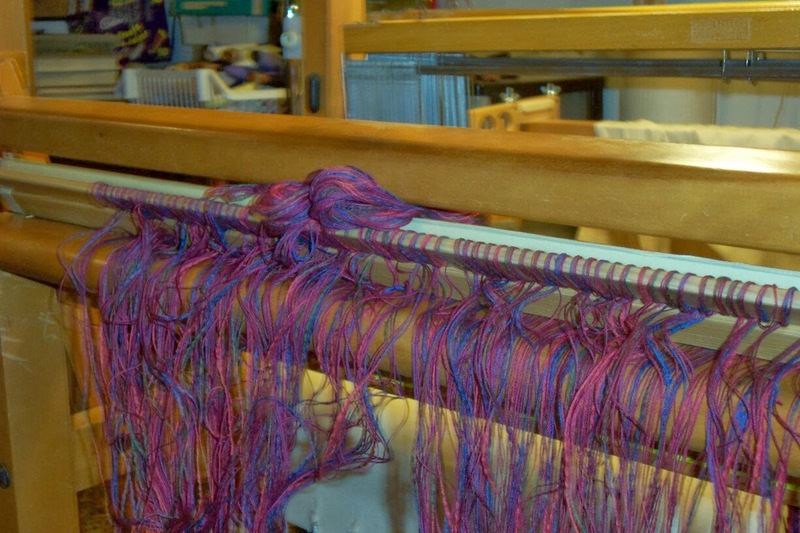 Thirdly, if I did want to re-tie I would beam the warp first, having cut the old warp off behind the heddles rather than tie onto the front of the loom and drag the whole mess through the heddles onto the beam. Especially with yarn that has residual twist energy in it. But beaming it from the back of the loom would be a pain because my valet is set up at the front of the loom. So no, I don't tie on any more. 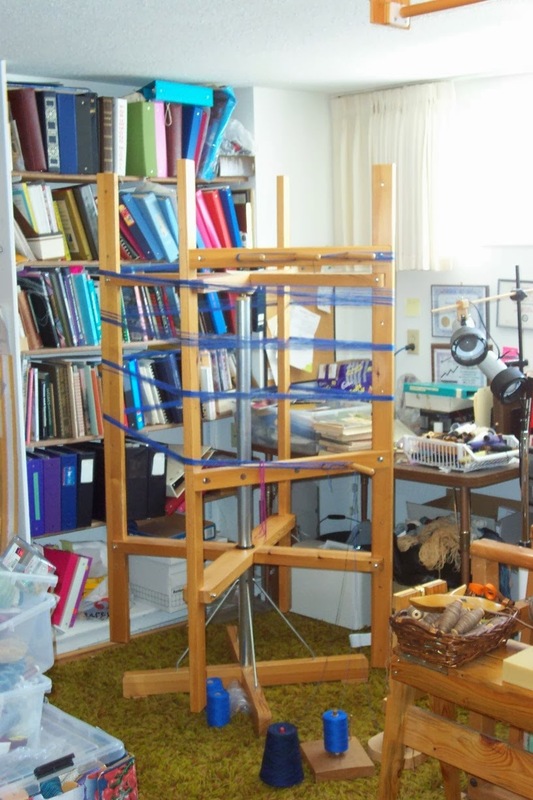 It's something I gave up doing a very long time ago when I was still slow at dressing the loom and tying on was a time saver. I'm getting low on yarn to use with the textured yarn to bundle a thicker weft so this will be the last place mat warp for a while. I'll go back to the towels and see if I can't get more of that yarn used up. But I am struggling to get back into a routine. Part of the reason is that none of the looming deadlines has reached 'critical' yet, although that will change very quickly. I've promised to send the yarns and instructions for the April workshop next week. And, since I can't find my master copies of the drafts, I will finally take the time to up-date that topic with a somewhat nicer format. It's been on my list to do for ages and I just never seem to find my round tuit. Now I've got to do at least this topic! It's not a big job, just time consuming, so I will have to begin working on that over the weekend. Next week is fraught with appointments and meetings so I'm going to have to find that round tuit quickly. My Leclerc Fanny has a certain maximum length of warp it prefers. 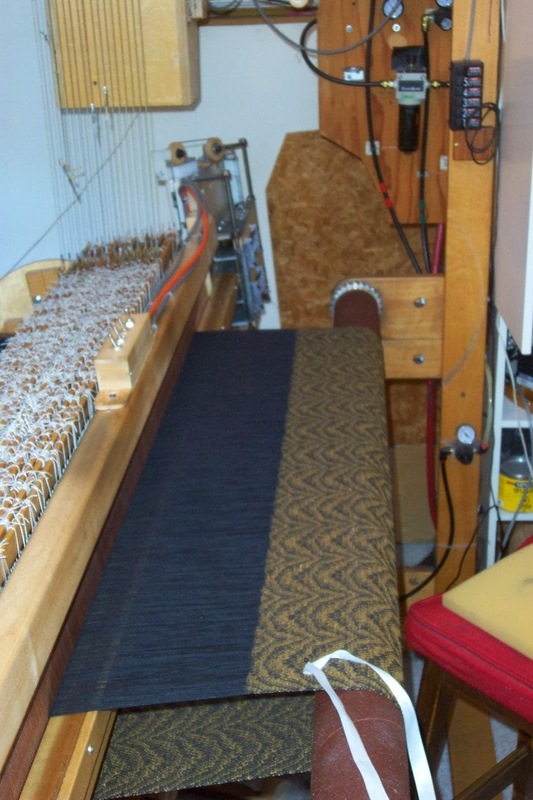 An 11 meter long warp fits nicely onto the back beam and the woven web behaves quite nicely as well, even with the thick weft I'm using for the place mats. However, with the mill I can wind a longer length warp so this warp was closer to 13 meters long. The woven web just barely co-operated and I managed to nurse the entire length onto the cloth beam without cutting and re-tieing. The thing is, with a long warp, when the cloth roll builds up it becomes more and more difficult to set the tension on the web each time the fell is advanced. The beam is no longer a nice firm round beam of hard wood but cushioned by the many layers of cloth wound round it. My next place mat warp is around 14 meters long. 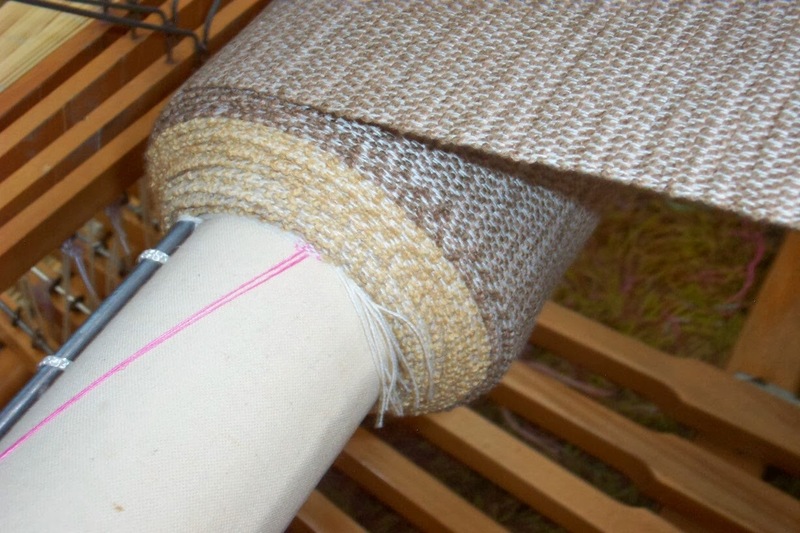 I will have to dig out a 7th (maybe even an 8th) bamboo blind in order to wind the warp onto the back beam and when I reach the mid-point, cut off, remove the woven web and re-tie. This minor inconvenience will be well worth it as if I didn't, getting proper tension back onto the warp as I advance will become a tug of war. Much better to just grit my teeth and do what needs to be done rather than get into a power struggle with the loom and warp. Since taking the photo, the tall gold/beige cone has been emptied. 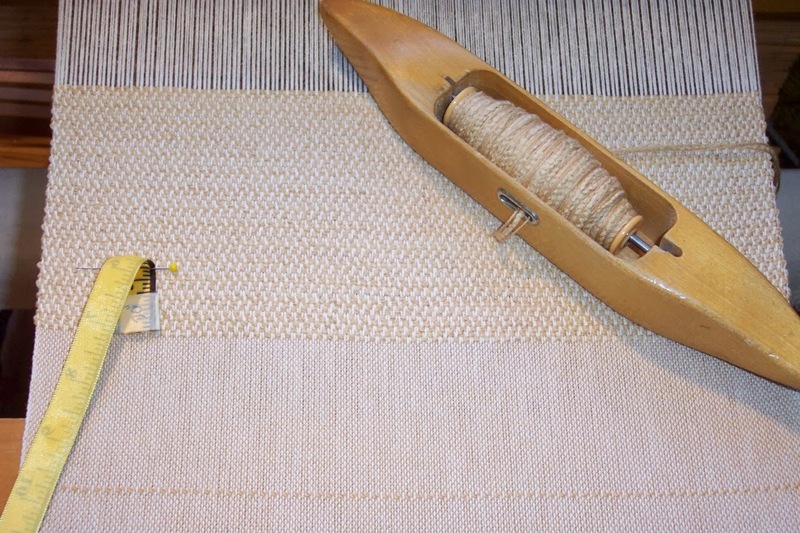 The mat warp is about half way woven and there is enough warp left to finish the gold/beige bobbins and hopefully start on the darker beige waiting in the wings. From the size of that cone, it will probably take two more warps to use it up - maybe three! And this is how the mats look on the loom. 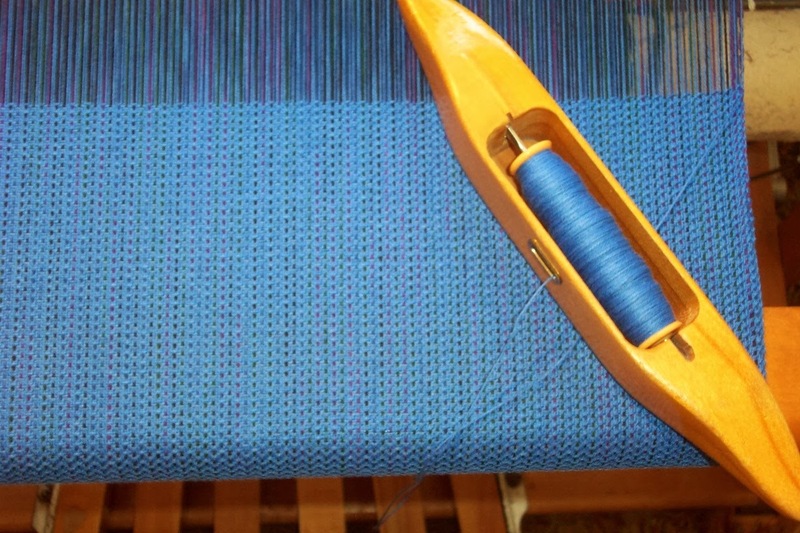 The photo shows the plain weave for hem and the start of the place mat itself using the bundled yarns to make a thick weft. For information on how I do this, check out Handwoven a few years ago. I believe I called the article/project Stash Busting Mats or something similar. People often tell me how patient I am to weave. Not at all. In fact I am a very impatient person! You don't need patience to do something you enjoy. Making textiles for other people to use and enjoy delights me in a way that I can't possibly describe. If you feel the same, no need for me to explain. If you don't, you wouldn't understand why I, and others like me, do this. The fact that people are willing to pay a premium for hand made items is a gift. That people buy my textiles means that I can continue making more. My productivity is such that I long ago out stripped being able to just give my stuff away. Not to mention that I also need a source of income - to buy food, keep a roof over my head, pay for a vehicle and gas to drive it. This is how I make my income. I supplement income from selling my textiles by teaching, either in person or by writing. Our society is changing in ways that may or may not be useful. The big change I see coming is the ability to produce publications like Magic in the Water, A Good Yarn, etc., and be able to sell them. Therefore the switch to considering an ebook of some type. The poll in January leads me to believe that there might be a market for such a book. The vote was pretty evenly split between projects and how-to information. I think I can see a way to combine both of those but will need some time to mull it over. Since this project is for after the Next Big Project happening in May, there is time to let things simmer on the back burner while I explore options. 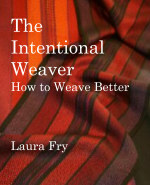 I approach writing a book in much the same way I do designing a textile. What is the purpose? How best can I arrive at that purpose? I will spend a lot of time puzzling over what is possible and how best to present the information I would like to convey. Before I left I had wound a couple of warps. One was a red warp for towels, the other a place mat warp. Decided I would run with the mat warp and hopefully use up one of the cones of yarn from Lynn's stash and maybe even start on the next, all on one warp. And it gives me a quick leap onto the loom. It seems like ages since I had any loom time. While I did help people with their looms, I really haven't done what I would call weaving for the last three weeks. It will feel very good to get back to it. 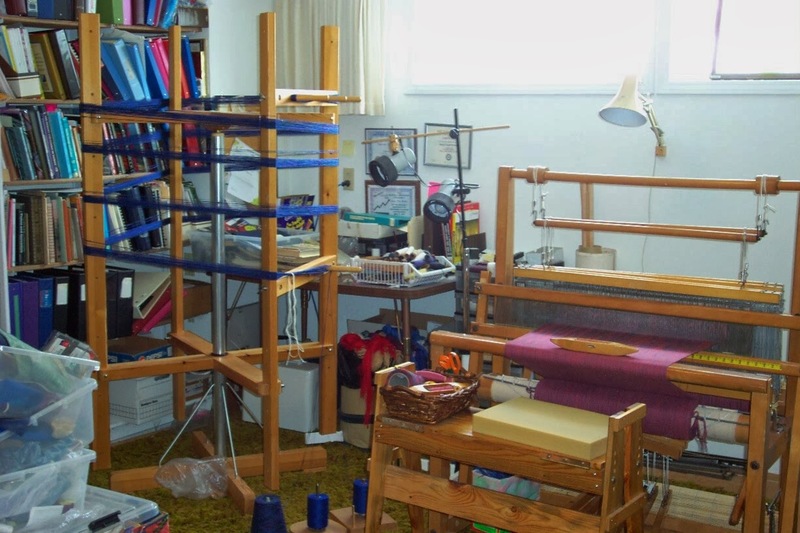 I have about 5 weeks before the Beginning Weaving class here, about 6 weeks before Fibres West. My plan is to have as many of the NBP samples done before those happen. But I'd also like to stay on top of using up my stash, so it may require some juggling. Not to mention getting the warp yarns and handouts ready for the Looking at Lace workshop in Tacoma mid-April. Those will have to be mailed in the next week or two, as well. Managed to roll in the door mid-afternoon after a lovely drive home. Although it is much colder here, it was dry and the sun even shone most of the day. I really don't mind the cold when the sun is shining brilliantly on the hills and valleys. The first order of business was to go through the stack of snail mail, sort out the bills for payment and even, much to my surprise, open a couple of small consignment cheques. One always hopes for one but never counts on them. Still have to unpack my bags. Since they won't unpack themselves, guess that now I've had a restorative cup of tea I'd better go deal with that. There will be a mountain of laundry to do, I managed to hem nearly all the towels we brought so those will need pressing, plus there are a few more emails to do yet, too. Not to mention two nekkid looms and 9 more boxes of yarn plus the yarn order from Maurice Brassard needing to be put away. Crossed the border this afternoon and headed north. We had a great time. It was fabulous to spend time with people who are special to us. We are all getting older and who knows how many opportunities there will be to sit and enjoy each others company? The last year brought home to us all over again how much we value the people in our lives. Until we can meet again in person the internet will serve to keep us in touch. Thank you to everyone we met along the way. Hope to see you all again.